Please note that the content of this book primarily consists of articles available from Wikipedia or other free sources online. 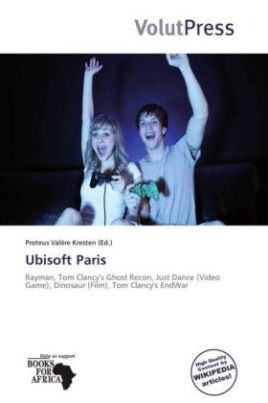 Ubisoft Paris is a French video game developer founded in 1986. It's also Ubisoft's headquarters. The studio is known for the Rayman, Tom Clancy's Ghost Recon, Raving Rabbids and Just Dance video game series.Rayman is a platform video game series developed and published by Ubisoft and created by Michel Ancel.Rayman games are typically platformer games, although spin-offs have had radically different gameplay. The original Rayman was a 2D sprite based platformer similar to those of the 16 bit era. Rayman 2 moved the series into 3D, and added more variety to the gameplay with new actions such as riding a rocket, being pulled through a marsh by a snake, and an entire level where Rayman's hair allows him to fly instead of simply hover. Rayman 3: Hoodlum Havoc kept the same core platforming of Rayman 2, but added timed power ups and had a bigger emphasis on combat.